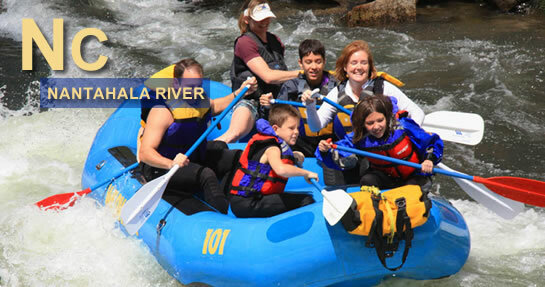 Nantahala River rafting includes Class II-III rapids through a beautiful and scenic gorge. The Nantahala River runs clear and cold as it is released from the bottom of Aquone Reservoir. Rafting trips are eight miles in length with an overall gradient of thirty-five feet per mile. The name Nantahala is a Cherokee word, which translates into “Land of the Noonday Sun,” because the canyon gets little sunlight until the sun is almost at its peak…around noon. 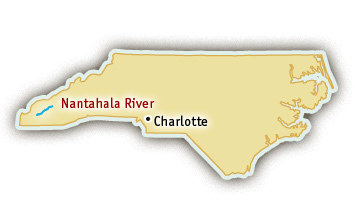 Visit their website for more information about Nantahala River Rafting. Most of the popular rapids are on the upper half of the river. With good current and consistent waves, the Nantahala is the perfect river for a family whitewater adventure. The biggest rapids are Patton’s Run, Delebar’s Rock and Nantahala Falls, a Class III drop just above takeout. Nantahala Falls was once considered Class V before techniques and equipment improved and the rating came down to Class III-. The Nantahala River is dam-controlled, so water is released for rafting and kayaking throughout the summer.